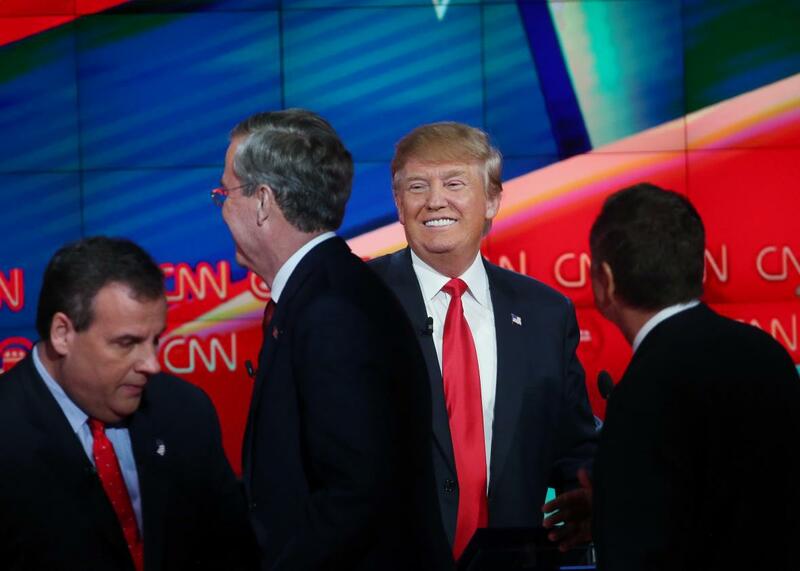 Fox Business debate preview: Trump v. Cruz, Rubio v. Bush. Donald Trump smiles as New Jersey Gov. Chris Christie, Jeb Bush, and Ohio Gov. John Kasich walk onstage at the CNN Republican debate on Dec. 15, 2015, in Las Vegas. Toward the end of the previous Republican debate, CNN’s Dana Bash set Trump up to deliver on his pre-debate promise to cut Cruz down to size. The billionaire, though, didn’t bite. “He’s just fine,” Trump said after literally patting his rival on the back. “Don’t worry about it.” Cruz, who at that point was still happily sailing along in the slipstream of Trump’s bluster, didn’t look a luxurious gift horse in the mouth. Flash-forward to present day, though, and the two men’s alliance is no more. Trump has spent the past several weeks hitting Cruz on his Cuban ancestry, questioning his religion, and reliving his past opposition on federal ethanol subsidies, a particularly sensitive subject in the corn-rich Hawkeye State. More recently, Trump’s reached into his birther bag of tricks to stoke concerns that Cruz isn’t even eligible to be president since he was born in Canada. The Texas senator, who last year was willing to turn the other cheek, finally began to swing back earlier this week (perhaps because he’s been slipping in the Iowa polls), taking aim at Trump on everything from his flyby campaign strategy to his foreign policy chops—and even highlighting the former reality TV star’s past ties to Hillary Clinton to suggest his former BFF is now working in concert with the enemy. All that has many politicos and pundits expecting Trump and Cruz to finally have the donnybrook that never happened last month. I wouldn’t be shocked if that happens; I also wouldn’t be surprised if it doesn’t. Time and time again, we’ve watched and waited for Trump to take on his challenger on stage—Bush this summer, Carson this fall, Cruz this winter—and yet when the time comes, the national polling front-runner plays it safe in a setting he’s never quite looked comfortable in. (He did go after Bush in this past debate, but that was picking on the weak guy, not attacking his main competition.) Cruz, meanwhile, is one of the strongest debaters in the race, but there’s no way of telling how a head-to-head with Trump would pan out given his uncanny ability to bully with grammatically challenged bluster. If both men ultimately decide to play it safe, it will suggest both are confident with their current strategies: Cruz believes he has the ground game to grind out a stage-setting victory in Iowa, while Trump believes he’ll be able to turn out enough first-time voters to change the game entirely. If instead they attack, that means they are each starting to feel legitimately threatened by the other. While it’s uncertain whether Cruz and Trump will tangle, there’s little doubt about what we’ll get from the establishment-minded foursome on stage: a brawl. Rubio, Christie, Bush, and Kasich have all bet big on New Hampshire, where GOP primary voters are significantly more moderate and establishment-minded than caucusgoers in Iowa. But as much as they’d love to win the Granite State, their more pressing concern is coming out on top of their Republican Party–approved rivals. For each, the most plausible path to the nomination today is to be the last man not named Ted or Donald standing after the early states—at which point they’ll hope to consolidate enough support to clinch the nomination. That’s a strategy that could still work, particularly since the primary calendar is back-loaded with a bevy of delegate-rich, winner-take-all Northern states, where candidates with more moderate images tend to do well. To accomplish that, though, they need to convince party power brokers and deep-pocketed donors, all eager to rally around a single candidate, to walk away from the other guys. If one member of the establishment-backed foursome bests the group by a convincing margin in New Hampshire, the others will start facing serious pressure to get out. We’ve seen this dynamic start to play out in recent weeks in New Hampshire, where Rubio, Christie, and co. have left Trump and Cruz largely untouched in favor of training their fire on one another. Christie is blasting Rubio, Rubio and Kasich’s respective super PACs are both attacking Christie, Bush’s super PAC is carpet-bombing the field, and seemingly everyone is making fun of Rubio’s fancy shoes. The group is unlikely to forgive and forget by Thursday night. Given his past strong debate performances, Rubio is the most likely of the bunch to give himself a boost—though he’ll continue to deal with increased expectations as the current establishment favorite. Christie, meanwhile, won’t have a Rand Paul–shaped foil to spar with for once, potentially freeing him up to devote his attention to another of his rivals. (The best thing Kasich and Bush—particularly Bush—have going for them is that national expectations couldn’t be much lower at this point. Jeb 2016: Catch the fever!) Still, debates rarely deliver knockouts, and Thursday’s establishment civil war is unlikely to produce a clear-cut winner among this group. The biggest risk for the Republican Party is that it turns into a circular firing squad.